"Since the JJIG was implemented, Georgia has reduced out-of-home placements by over 50% in incentive Grant recipient counties compared to the 2012 baseline. During the first year of the JJIG, 1,122 youth were served through EBPs, and by the third year, the number of youth served had increased to 1,723 youth, for a total of 4,511 youth served in those three years. In addition, the overall graduation rate for youth in the JJIG program was 62 percent, with some EBPs seeing rates up to 85 percent. Governor Nathan Deal was pleased to learn Georgia had received the award. 'Georgia has achieved monumental success in juvenile justice reform in recent years and continues to lead the nation with meaningful criminal justice reform," Deal said. "This national honor is a reflection of not only our efforts thus far but our unwavering commitment to increasing public safety for our state and our citizens through a more effective justice system.'" In a parallel report, released in early 2017, the ‘Georgia Report of the Georgia Council on Criminal Justice Reform,’ highlighted the historic reductions in commitments to Department of Juvenile Justice facilities. Prior to the reform effort, led by Governor Nathan Deal, himself a former juvenile court judge, Georgia’s juvenile justice system was heavily reliant on expensive out-of-home facilities that were producing poor results for taxpayers and youth alike. 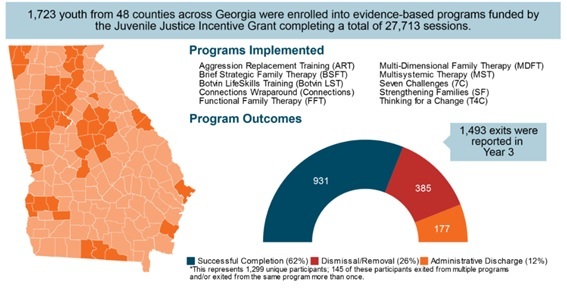 To encourage the spread of evidence-based programs in the community, Georgia created a voluntary incentive grant program, which has helped counties make significant progress in reducing their use of out-of-home placements and establishing community alternatives. Since first awarding grants to participating counties in 2013, the Juvenile Justice Incentive Grant Program has directed more than $30 million to support evidence-based programs throughout the state. Evidence-Based Associates has been a key partner in the initiative from the beginning, collaborating with the office of Governor Nathan Deal, the Department of Juvenile Justice (DJJ) and the Criminal Justice Coordinating Council (CJCC). According to the recent report, during FY 2016, the grant program provided funding for evidence-based programs to 28 grantees serving 48 counties. 1,723 youth were served by providers during the year: Nearly all of the youth served were scored as medium- or high-risk in their pre-disposition assessments, with two-thirds of participants successfully completed their programs. The grants helped reduce short-term program admissions and felony commitments to DJJ by 53 percent across the participating counties. For a discussion on the reduction in Georgia's residential population, please click on the "Population" tab above. Since 2013, Georgia has reduced its number of youth in secure confinement overall by 36 percent and the number of youth in secure detention by 11 percent. During that same time frame, overall juvenile commitments to the Department of Juvenile Justice have decreased by 46 percent. For a discussion of EBA's impact on the reforms in Georgia, please click on the "EBA Impact" tab above. EBA currently has partnerships with twelve counties serving more than 800 youth and families during 2016-17. Programs managed in counties partnered with EBA include Functional Family Therapy (FFT), Multisystemic Therapy (MST) and Thinking for A Change (T4C). In its role as Managing Entity (ME), EBA ensures that all program components are delivered in strict adherence to all prescribed fidelity measures. EBA works behind the scenes to ensure that top-tier evidence-based programs are implemented as intended and all facets of implementation are rigorously managed, including provider selection, staff training and certification and fiscal oversight. Most jurisdictions find this level of multi-dimensional (and practical) technical assistance invaluable. According to the Reform Council report, there was an overall 56% reduction in placements among all participating counties: Counties not in partnership with EBA experienced reductions of 46% while those working with EBA as managing entity saw a decline of 65% (a 41% improvement). "The services provided by EBA has greatly improved Grace Harbour's service delivery as a provider of evidence based services and has directly contributed to greater service outcomes, including increased program family retention rates, decreased criminal charges, and decreased recidivism rates for the youth and families served. 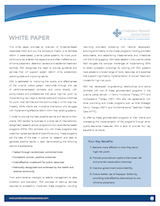 EBA has and continues to play a vital role in the programmatic success of our MST and FFT teams at Grace Harbour." For a discussion on EBA and its impact on public safety, please click on the "EBA & Public Safety" tab above. Before the Juvenile Justice Incentive Grant Program was initiated in 2013, the Pew Charitable Trusts reported that more than half the youth in the Georgia system were re-adjudicated delinquent or convicted of a criminal offense within three years of release. For those released from Georgia’s secure youth development campuses, the recidivism rate was worse – a disturbing 65 percent. Thus, one of the driving forces behind Governor Deal’s leadership was to ensure the taxpayers and citizens were going to be protected from such unacceptable levels of repeat offending by youth released from DJJ facilities. Overall, since the first successful program completions occurred in early 2014, youth in EBA-managed programs – MST and FFT – have an overall recidivism* rate of 25% - a significant reduction from the rate reported by Pew statewide in 2013. [Disclaimer: This is not officially reported recidivism and does not include adult data. Therefore, it should not be compared with the state’s official reporting. It nonetheless provides an estimate of the improvements that may be attained through careful evidence-based program selection and provider oversight]. "As we move into our fourth year of incentive grant funding, we continue to be pleased at how juvenile-specific, evidence-based interventions have positively impacted the lives of children across Georgia. We are particularly pleased that family-focused models, like Functional Family Therapy and Multi-Systemic Therapy, have expanded into more rural areas of our state and are available to more families than ever before. We are appreciative of the services EBA has provided families in our state from the beginnings of our juvenile reform in 2013."